Vietnam is a beautiful place filled with amazing food, brilliant landscapes, and unique revolutionary history. If you’re traveling on a tight budget, you’re in luck because Vietnam is also extremely affordable. Not so fast, this doesn’t mean you should just wing it. Inexpensive Vietnam vacation costs could mean you end up spending way more than you originally intended. But that’s why you’re here right? Here’s how to budget your Vietnam trip costs while having an amazing experience in an incredible place. Traveling on a budget doesn’t mean you have to cut corners – just do some thorough planning before embarking on your journey. The trick to keeping your Vietnam vacation costs down is actually sticking to the budget you set. All the prices below are listed in USD and calculated for one person where applicable. Backpacking in Vietnam or staying in hostels is absolutely safe and fun for some folks but it’s definitely not for everyone. You can still enjoy the privacy and comforts of a hotel without breaking the bank. Here is a brief breakdown of prices in Vietnam depending on how much you want to spend. The biggest splurge on Vietnam trip costs will likely be your plane ticket. One great thing about Vietnam is the variety of accommodations to choose from. Whether you’re traveling on a strict budget or dead set on a luxurious vacation, you’re sure to find something to meet your Vietnam trip costs in different cities throughout the country. Plus, Vietnam is a fairly large country: culture, sights, and weather varies greatly between the northern, central, and southern regions. You’ll definitely want to see it all. Why not backpack in Vietnam at a rural hostel and then splurge on a hotel somewhere else for a few days? Accomodation prices can either make or break your Vietnam vacation costs. Hostels and Backpacking in Vietnam: Hostels in the northern region range from just $6 to about $40 per night. In central regions, hostel prices in Vietnam range between about $15 to $60 per night. (Prices are generally higher along the coast.) In the south, rates are just slightly higher at $20 to $80 for your nightly stay. Mid-range Hotels: You can find affordable and comfortable hotels in Vietnam’s north for between $15 and $60 per night. In central regions, expect to spend about the same amount each night. Remember that prices are slightly higher along coasts and in densely populated areas. In the south around Hồ Chí Minh City, budget a little more money for $20 to $80 per night. Luxury Resorts: If you want to relax – even for just a night or two – Vietnam is the place to go all out. Luxury resort prices vary drastically depending on the facility. In general, you can plan $100 for a standard 5-star hotel to over $600 per night for all the bells and whistles on a beach resort. As with the other accommodations, resorts in the north are a little more budget-friendly than around Hồ Chí Minh City. If you’ve ever known someone who’s traveled to Vietnam, you probably know all about the country’s amazing variety of dining options – no matter where you find yourself. The incredible street vendors make it easy to enjoy a high-quality meal while backpacking in Vietnam on a budget. Like accommodations, remember that you don’t need to see your food budget in black-and-white all-or-nothing terms. You can always plan a few high-end meals at some of the nation’s best restaurants and spend the rest of your visit enjoying delicious – yet very healthy – street food to keep your Vietnam vacation costs down. It’s important to point out that flavors and ingredients vary drastically based on which region you’re in. This is due to traditional culture, climate, income levels, and ingredient availability. Bánh mì (a baguette sandwich with local ingredients) and phở (a broth-based soup filled with fresh local ingredients and rice noodles) are excellent options you probably won’t be able to get enough of. Street Food and Vendors: Budget yourself about $10 to $15 per day. Each meal will likely cost between $3 to $5 depending on the ingredients and location. If you’re from the U.S., you might think “clean and tasty street food” sounds like an oxymoron. This is not the case in Vietnam where vendors are generally very sanitary, delicious, and well-maintained. Mid-range Casual Restaurants: If you want to eat at sit-down restaurants for each meal, plan to spend between $15 to $30 each day of your trip. Meals at casual air-conditioned restaurants usually cost between $5 to $10. Fine Dining: If you’re planning a luxurious getaway and want to feast like a king without worrying about Vietnam trip costs, budget yourself anywhere from $60 to over $200 per day. If you’re ready to spend the money, a steak dinner with fine wine or a fine French restaurant could set you back over $200 for only one meal – just like in the West. Desserts, Snacks, and Beverages: For non-alcoholic beverages like coffee, teas, fruit drinks, bottled water, and sugary local delights, each drink will set you back about $0.30 to $0.80. You’ll love the broad range of tasty snacks and sweets you find in Vietnam which range in price from about $0.90 to $2. Please, please drink responsibly! This is extremely important to emphasize because alcohol prices in Vietnam make it very easy to go overboard. Vietnam offers a wide variety of unique alcoholic beverages for you to enjoy (in moderation of course). Most drinks you buy along the street are stored warm and served over ice – beer and wine included – so keep that in mind throughout your travels. Local alcoholic drinks like rice wine, beer, and distilled liquors are easy to find and significantly cheaper than imported options you’re probably accustomed to. But the fun of traveling is trying new things, right? If you’re feeling adventurous, look for the medicinal alcoholic beverages like rượu thuốc distilled with animals like seahorses, scorpions, or snakes. Local Beer: $0.25 to $2.50 depending on the variety and location. Like Western countries, craft beers are a little pricier. Beer prices definitely won’t affect your Vietnam trip costs too much. Wine: Sorry wine drinkers, a glass – even of local wine – will likely set you back $5. Splurging on wine with your meal each night could derail your budget and send your Vietnam vacation costs skyrocketing. Distilled Liquor: Wine lovers on a budget might want to switch to spirits for their trip as liquor prices in Vietnam are considerably lower. This is where it gets dangerous if you aren’t careful: local moonshine costs less than $1 in many locations. Even your favorite top-shelf special occasion brands average about $11 to $13 per bottle. Now we’re getting to the fun stuff: events, excursions, and activities. If you crave excitement and thrills, Vietnam has you covered. Maybe you’d rather relax and soak up the local culture and history – there’s plenty for you too. Your Vietnam vacation costs for activities depends entirely on how much you want to spend. The landscape and local sights make it easy to keep your Vietnamese vacation costs down. At the same time, you can fill your days with tours and other activities that cost considerably more money. Here are some of the most popular attractions so you can estimate how much you might spend per day depending on your interests. Day Trip to Hạ Long Bay Island: about $40 depending on the company. Here you can enjoy an amusement park, cave tours, kayaking, and much more. Mekong Delta: Floating markets and lots of fruit and seafood. Free. Củ Chi Tunnels Under Hồ Chí Minh City: An important historical landmark which costs about $20 per person. These were dug by hand during the war. Sapa Rice Terraces: One of the most beautiful places on the continent. Group tours average about $30 per person. In addition to your accommodations, transportation will make up another large chunk of your Vietnam trip costs. Transportation prices in Vietnam are very reasonable for the most part but like hotels, they also vary drastically depending on the vendor. Traffic can get pretty bad so try to work some flights into your budget if you can afford it. Vietnam is a fairly large country and you’ll probably want to see a lot of it while you’re there. How will you get around? Scooters and moped rentals make backpacking in Vietnam easy. If you’re not comfortable driving yourself around a strange country, don’t worry: there’s no shortage of other options. Between domestic flights, buses, and trains, Vietnam has something to fit your needs and comfort level. Domestic Flights: $30 to $60 and up depending on the distance and season. Buses: About $7 for a 10-hour trip complete with WIFI. Many buses include karaoke machines too. Trains: A very affordable way to travel around the country if you have lots of time. The longest trek from north to south will set you back about $60 but it includes overnight accommodations, comfort, and some tranquility. Scooters: You can rent a scooter for about $6 per day. Don’t forget to budget some money for gas (and fluctuating prices). Who doesn’t love filling their suitcase with unique treasures from their travels? Make sure to leave some room in yours when you visit because Vietnam is filled with local markets and shopping centers. From handcrafted artwork and goods to clothing and cards, you’ll have no trouble finding gifts and keepsakes to remember your trip. Just make sure to factor souvenirs into your Vietnam vacation costs. Prices in Vietnam for basic goods like these are very affordable so this should be easy to do. Like many other things, you can either go budget-friendly or all-out – what you want to spend is entirely up to you. These are some of the most common souvenirs to give you a general idea of how much to spend. Áo dài: You’ll definitely want to score at least one of these traditional embroidered dresses. On average, expect to spend $30 and up depending on the detail. Sand paintings: These intricate paintings cost between $15 and $35 – they’re definitely worth it! Fans: Score a unique hand fan for yourself or your friends at just $1. Guốc Mộc: Traditional wooden clogs worn during festivals. Between $5 and $10. Traditional Silk: $20 to $30 depending on the item. Nón lá: These straw hats range between $2 and $5. Now that you have a decent understanding of the general Vietnam trip costs, here are the best tips for making the most out of your budget. Don’t book transportation or tours through your hotel or hostel. Make sure to shop around for the best prices to avoid high commission rates and inflated tourist prices – this can shoot your Vietnam vacation costs through the roof. If something seems out of your price range, don’t be afraid to haggle a bit. Just make sure to keep it respectful – vendors need to make money, too. Eat local. Imported foods like pizza often cost a lot more money and won’t be the same quality you’re used to – stick with local delicacies. Look for free or super-low-cost activities like historic temples or just walking through the cities – you’ll find plenty! By applying for your visa now, you can save both time and money on your Vietnam vacation costs. Just fill out the quick online application form, pay the $17 service fee, and receive your Approval Letter from the Vietnam Immigration Department via email – sometimes within hours. 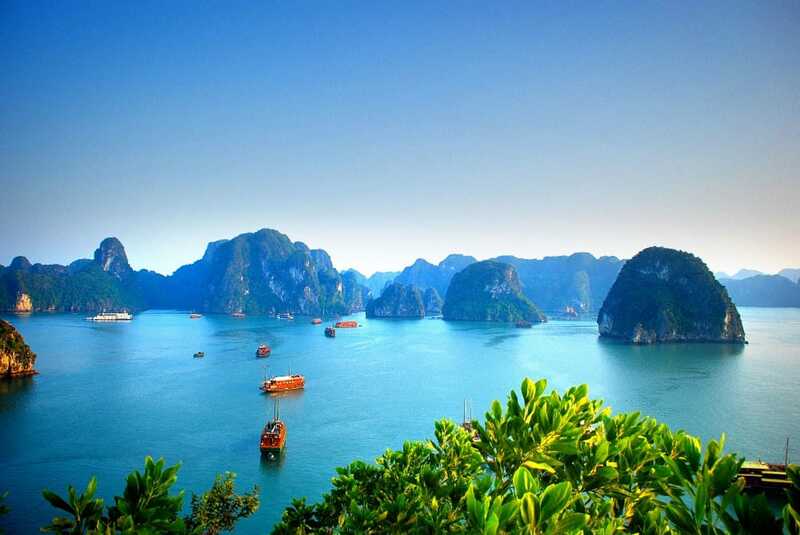 All visitors need a visa when traveling to or through Vietnam. Our convenient process makes it easy: apply for your visa now!